Q: What can I do if the Powerline adapters do not work automatically via “plug & play”? Q: How do I add a new Powerline adapter to an existing Powerline network? Q: How do I clone my router's WiFi if pressing the WPS buttons do not work, or if there is no WPS button on my router? A: You can manually configure the Powerline extender’s wireless name and password to be the same as the router's through the Powerline extender's web interface. For detailed instructions, please refer to FAQ 398. Q: How can I configure the Powerline adapters on MAC or Ubuntu OS? A: For MAC 10.6 or later, we offer the Powerline Utility and Powerline Scan Utility to manage our Powerline adapters. For Ubuntu or older versions of macOS, we do not provide configuration utilities. Instead, please configure the adapters on Windows OS, then use the pair buttons and web interface to configure our wireless Powerline adapters. How Do I Secure My Wireless Powerline Extender on a Mac Computer? Q: Are all TP-Link Powerline adapters compatible with each other? Are TP-Link Powerline adapters compatible with adapters of other brands? A: TP-Link Powerline adapters utilize HomePlug AV/AV2 Standards, which means all of our Powerline adapter models are compatible with each other and can be used within the same network. However, please bear in mind the overall Powerline rate will adaopt the lowest HomePlug AV standard rate when using various TP-Link Powerline adapter models in the same network. For adapters of other brands, if they adopt the same standard, they may be compatible with TP-LINK adapters. However, please bear in mind that different brands’ products will have different methods to pair and configure the adapters. As a result, we suggest it might using Powerline adapters from the same brand to ensure convenience and compatibility. Q: Can several Powerline networks exist simultaneously in same power circuit? A: Yes. 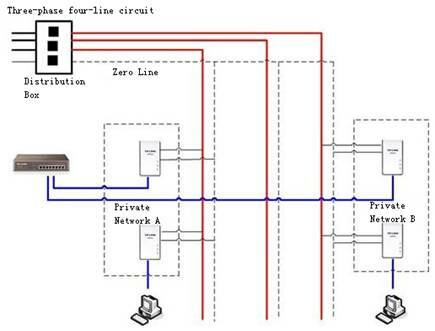 The Powerline networks can be separated by different network names. About how to change the network name, it can be made by the pair button or attached Utility. However, the overall throughput is shared by the multiple networks, please be informed of this. Please refer to the FAQ 258 to change the Powerline network names. Q: How many Powerline adapters can be paired together? Q: Why can't my Powerline rate reach the reference speed? A: The theoretical maximum channel data transfer rate of Powerline adapters is derived from HomePlug AV specifications. Actual data transfer rate will vary from network environment variables including, but not limited to: distance between adapters, network traffic, noise on electrical wires, building material and construction, quality of electrical installation and other adverse conditions. Q: What can I do if my Powerline rate is very slow? A: Powerline products transmit data through the electrical wiring of your house. The Powerline network rate is mainly decided by the quality of the electrical wiring environment. Please refer to FAQ 409 for suggestions. Q: Can TP-Link Powerline adapters work in different phases of three-phase circuit? A: Yes, but the Powerline rate will be affected when crossing the phases. For three-phase four-line circuit, we suggest using the topology below for optimal results. Q: If I have numerous Powerline adapters in the same network, will network bandwidth be affected? A: While in the same private Powerline network, all connected devices share available bandwidth. Q: Can TP-Link Powerline adapters work in multi-voltage circuits? A: Yes. The voltage range that Powerline adapters can work with is 100-240V, and general voltage fluctuation will not affect stability. Q: Can Powerline adapters work if they are separated by UPS? A: No. Usually, UPS devices will have filtering functions, which can prevent a Powerline connection. Some power outlets and circuit breakers may also have surge, ground-fault, or arc-fault protection functions, which can also interfere with, or prevent Powerline connectivity. We do not recommend using Powerline adapters in such environments. Q: Can Powerline adapters work if they are separated by different electrical circuits? A: The answer in this case may vary depending on which HomePlug AV standard is in use (HomePlug AV vs. HomePlug AV2). For HomePlug AV Powerline adapters, each adapter should be on the same circuit (breaker) for optimal results. If the adapters can pair in the same room, but the Powerline LED turns off when you move one Powerline device to another area, this usually indicates they are plugged into separate electrical circuits, thus preventing them from communicating. In such cases, please try different locations. However, the HomePlug AV2 standard introduces new technology and features, allowing Powerline adapters to communicate as long as they are on the same main circuit (panel). Q: What can I do if I don't have Internet after connecting to a Powerline network? A: Please refer to FAQ 392 for troubleshooting steps. Q: Do I need to reset the Powerline adapters/extenders if I’ve changed my router? A: Not necessarily. As long as you retain the existing configuration in which the Powerline adapters/extenders connect to your router, a reset shouldn't be required. If you need to adjust the wireless settings of any Powerline WiFi extenders in order to match the new router’s settings, please press the WPS button on the router and then Wi-Fi button on the adapter; or refer to FAQ 398. Q: Why do my Powerline adapters interfere with some other devices? A: The HomePlug AV/AV2 protocol utilizes the same frequency as some other devices within your home. As a result, Powerline products may interfere with devices such as lighting systems that have a dimmer switch, or a touch-sensitive on/off feature, short wave radios, cable television system, VDSL devices, speakers, or other Powerline devices that do not follow the HomePlug AV/AV2 standard. Q: Can appliances affect the performance of Powerline products? A: Yes, please refer to FAQ 882 for detailed information. I run 3 x PA9020v1.0 on my home network and secure the adaptors using the MAC desktop app. Once secured however I cannot see the powerline adaptors within the app, is this meant to be the case? @smithg38 If all the adapters are paired together you should be able to see them on the powerline utility as long as you are connected to the same network. If possible wire your computer to one of the powerline adapters, you should now see them or all three. it's really good for Mobile. Emu4iOS Download on Ios to downlaod third party app stores, u have look for many but need genuine one...here We have emu4ios for ur ios devices. how can ai protect the power extension tplink with a password? I use this great tp-link until now. Ebooks free download pdf, free ebook download pdf, free books download pdf, free ebooks for kindle, get free ebooks, free pdf books bestsellers, free download pdf, free pdf books download, free novels download pdf, novelas gratis. I think the question is something else answering is giving you something else. Everyone is telling you about your adapter. Just answer the correct answer so that we too know the most thank you all of your friends. Copyright © 2018 TP-Link Technologies Co., Ltd. All rights reserved.